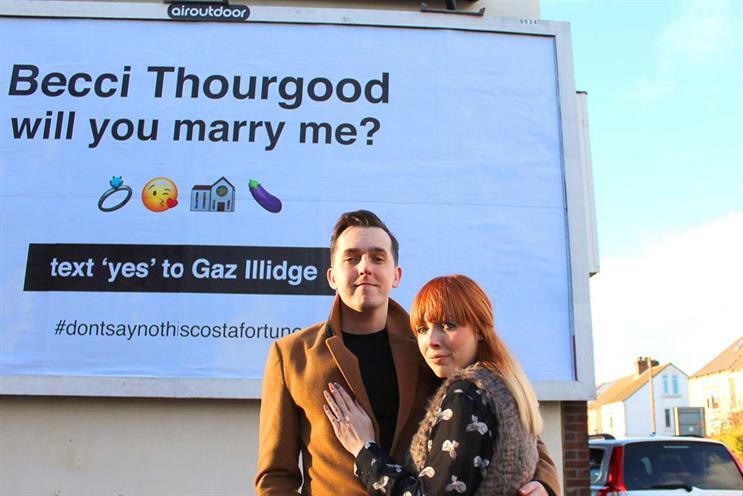 A man in Pontefract, West Yorkshire, successfully asked his girlfriend to marry him through the medium of outdoor advertising. Gareth Illidge, 29, rented the adspace on Pontefract Road from Airoutdoor earlier this month in order to pop the question in grandiose style to Becci Thourgood, 27. Illidge, a graphic designer, created the emoji-inspired poster himself. It read: "Becci Thourgood, will you marry me? Text ‘yes’ to Gaz Illidge. #dontsaynothiscostafortune"
Paul Inman, director of Leeds-based Airoutdoor, said: "This is probably the most unusual use of our billboards to date. It’s great to play a small part in such a special occasion and we wish them the best of luck for the future." Illidge said: "I wanted to do something out of the ordinary by asking the big question on a local billboard. I think the main reason was because I’m quite a shy person and wanted to do something a little out of character. "I’m very pleased with how it all went. We’ve since had dozens of phone calls from people saying they'd seen the billboard and loved it.